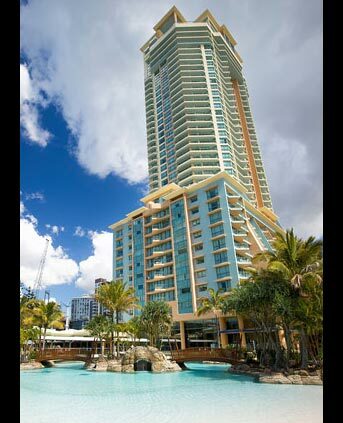 Crown Towers Resort offers spacious accommodation and excellent leisure facilities in the heart of Surfers Paradise. Close to the river canals and just a short stroll to the beach, the resort offers a quiet, tranquil setting ideal for holiday-makers wanting to be close to the action of Surfers Paradise, but not in the thick of it. Accommodation options at Crown Towers Resort include a range of self-contained one, two and three-bedroom apartments with fully-equipped kitchens and laundry facilities, cable TV and private balconies. There’s plenty of activities to keep the kids entertained with a games rooms, a lagoon-style pool with its own sand beach, waterslide and pirate ship to climb about. There’s also a 15 metre indoor heated pool, fully-equipped gymnasium, spa and sauna. Crown Towers Resort also features the award-winning restaurant, Chiangmai Thai restaurant. Crown Towers Resort is truly a world class apartment resort. 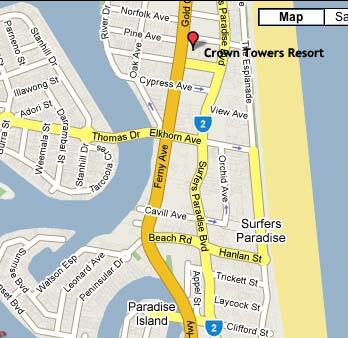 Crown Towers Resort offers a range of spacious accommodation options including one, two and three bedroom apartments. All apartments are fully self contained with kitchen and laundry facilities, and feature their own private balcony with many offering ocean views. Available with 1 queen. Features air conditioning. Crown Towers Resorts offers extensive facilities with many well-suited to keep the kids entertained. Sit back and relax while the kids take advantage of the numerous games on offer in the games room, or enjoy the lagoon-style pool with its own sandy beach, waterslide and pirate ship to climb about. Stroll through the exciting shops, or visit the many bars, clubs or restaurants of Surfers Paradise. Your hosts look forward to welcoming you and ensuring you have a great holiday.